Ferndale Confectionery in known throughout the industry as being ‘innovators’ of new-aged confectionery. Ferndale was the first confectionery business in Australia to introduce products onto the Australian Market manufactured with only Natural Flavours and Natural Colours. In 2013 the company launched the first ‘mainstream’ Sugar Free Mint sweetened with the Natural Sweetener STEVIA. Ferndale’s brands such as JOLS and SLIM FRUITS not only overcome concerns about calories, fat, and high sugar content causing tooth decay and contributing to other major diseases such as Diabetes, they go further by incorporating positive nutritional benefits such as high levels of Soluble Dietary Fibre. Soluble Dietary Fibre is an important nutrient and most nutritionists agree that Western diets provide lower than recommended levels. Regulation of transit through the digestive tract. Lowering of the postpran- dial glycaemia and the blood cholesterol content. Acidification of the large gut content. Stimulation of the benefi- cial colic flora (bifidobacteria and lactic acid bacteria). JOLS and SLIM FRUITS are zero fat, low calorie, sugar free products. Consumption of these products will cause only small rises in blood glucose levels. However, as with any carbohydrate modified special dietary product, it is always recommended that people with diabetes assess the effect of consumption of products on their blood glucose levels to determine the role of products in their diet. The additional advantage of JOLS and SLIM FRUITS® for diabetics is the small portion size and the hard rubbery texture which slows the rate of consumption. Given the above, JOLS and SLIM FRUITS® are very popular with diabetics. It is scientifically well established that frequent consumption of sugar, particularly between meals, increases the risk of dental caries.1. 2 The fact that caries (tooth decay) con- tinues to be a significant dental health problem, demonstrates routine oral hygiene and the use of fluoride as is currently practiced, cannot completely protect the teeth of susceptible people from dietary risk factors. Although most consumers have some knowledge regarding the relationship between the intake of sugary foods and tooth decay, the consumption of sugary sweets remains the norm, especially among children whose newly erupted teeth are particularly prone to caries formation and who lack the skills and motivation to brush their teeth regularly and correctly. Dentists have attempted to modify consumption behavior for years, but the desire for sugary snacks and the power of the advertising dollar driving emotional appeal, have largely over- whelmed the rational risks of tooth decay. In recognition of these circumstances, the World Health Organization and the Swiss Dental Profession implemented a strategy to positively advise consumers regarding confectionery which could be consumed without harming teeth, rather than indiscriminately advising against confectionery as a whole. From the early 80’s, a global movement has developed with clear formal guidelines regarding “Tooth Friendly” confectionery. 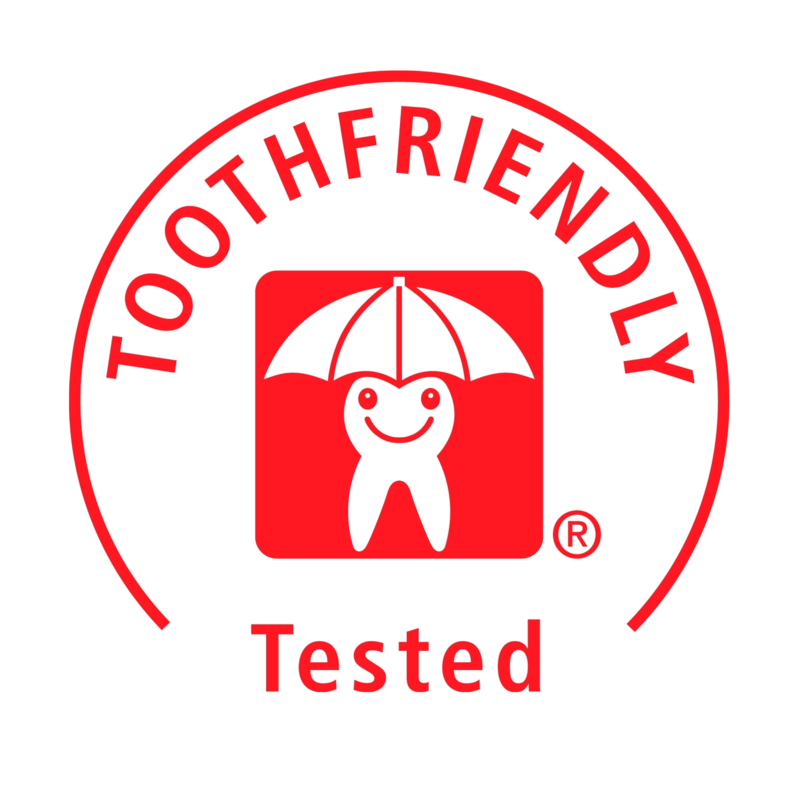 Manufacturers can now have their products approved as “Tooth Friendly” and carry the international Tooth Friendly logo, on packaging. To be approved, products are clinically tested by using an in vivo plaque—pH—telemetry test, carried out by an approved testing laboratory. The test has been used for 20 years, and internationally recognized in 1985. 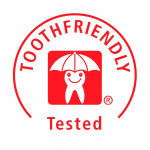 Tooth Friendly products do not promote tooth de- cay and qualify for distinction with the international HAPPY TOOTH Logo. JOLS and SLIM FRUITS® have been clinically tested and approved, making them the first Australian products to carry this important certification. A.J. Rugg-Gunn, “Nutrition and Dental Health”, Oxford University Press, Oxford, 1993, Chapter 6, p113. E. Newbrun, in “Sugars and Sweeteners”, N. Kretchmer & C. B. Hollenbeck (eds), CRC Press, London, 1991, Chapter 10, p. 175. Whilst reducing the level of fat intake is an important dietary focus for weight control, sugar intake reduction also plays a role. Australians consume on average around 40kg of refined sugar per person per year more than is considered healthy. This is equivalent to a daily intake of 22 teaspoons, and provides 440 calories or 1840 kilojoules each day. Most Australians would benefit from halving this intake. Most sugar in our diet is “hidden” in processed foods such as soft drinks, cordials, fruit drinks, canned fruits, confectionery, biscuits, cakes, jams, ice cream, jelly and breakfast cereals. The body can obtain sufficient sugar for its needs from carbohydrate rich foods such as bread, rice, spaghetti and other pasta, potatoes, corn, fruit, vegetables, beans, nuts, seeds, and lactose in milk. These foods are also rich in other nutrients. Refined sugar is referred to as “empty” calories, because it supplies calories but negligible nutrients and no fibre. Products such as JOLS and SLIM FRUITS® do not contain sugar. To replace the sugar two components are required, a bulking agent and an intense sweetener. The bulking agent used in JOLS and SLIM FRUITS® is Sorbitol, which is a sugar alcohol obtained by chemical reduction of glucose or fructose. It also occurs naturally in many fruits, including pears, plums, peaches and cher- ries. It is about half as sweet as sucrose, (sugar), and has a mouth cooling effect. Sugar alcohols such as Sorbitol have less available kilojoules than sugar, because they are more slowly absorbed by the body, and result in only a small rise in blood glucose levels. There are individual differences in the rate of absorption, and in some individuals sugar alcohols are not absorbed, leading to abdominal gas, flatulence, a laxative effect and in some cases discomfort from abdominal distention. It is generally accepted that 40 grams of Sorbitol can result in a laxative effect. A full pack of JOLS or SLIM FRUITS® con- tains around 11 grams of Sorbitol, and because the products are designed for slow consumption, laxative effects will be rare, with highly sensitive individuals. Intense sweeteners act to balance the lower sweetness level of Sorbitol, and to enhance the Flavour of products such as confectionery. JOLS and SLIM FRUITS® contain Acesulphame Potas- sium, (Ace—K, SUNETT), as an intense sweetener. SUNETT has been in use since 1967, and is totally safe to health and ideally suited for use in foods. Over 4000 products incorporate SUNETT in more than 100 countries. It is 150-200 times sweeter than sugar, and has no kilojoules, has no effect on blood glucose levels and is rapidly excreted in the urine. For JOLS and SLIM FRUITS® , carbohydrates are derived from the ingredients Sorbitol and Acacia Gum. Acacia Gum is a hetroglycan which is an unavailable carbohydrate or soluble fibre which is not absorbed by the upper intestine. There is some fermentation of this resistant starch in the colon to produce fatty acids which are absorbed and contribute some energy value. It is estimated that the Acacia Gum contributes less than 2 kj/gram. Sorbitol has a low energy value of around 5.0 Kj/gram, which is less than one third of stan- dard sugar based confectionery. STEVIA – WHAT IS STEVIA? Stevia is a genus of about 240 species of herbs and shrubs in the sunflower family, native to subtropical and tropical regions from western North America to South America. The plant was used extensively by the Guarani people of Paraguay for more than 1,500 years, and has a long history of medicinal use in both Paraguay and Brazil. The leaves have been traditionally used for hundreds of years in to sweeten local teas, medicines and as a “sweet treat”. Ferndale has now captured the secrets of the Stevia plant and has reformulated the JILA® Sugar Free Mints by removing the high intensity artificial sweeteners and replacing them with the Natural sweetener Stevia . The species ‘Stevia Rebaudiana’, commonly known as sweetleaf, sweet leaf, sugarleaf, or simply stevia, is widely grown for its sweet leaves. 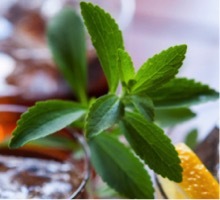 To produce Rebaudioside A (the part of the Stevia Rebaudiana Plant used to sweeten the JILA® Sugar Free Mints), the stevia plants are dried and subjected to a water extraction process. Stevia is 250 times sweeter than sugar, but for those watching their carbohydrate or caloric intake, Stevia is both carbohydrate and calorie free. This makes it possible for dieters to satisfy sweet cravings without wrecking their eating plans. Maintaining healthy stable blood sugar levels alone will set many people down a path to a healthy weight. Stevia is on the GRAS (Generally Recognized as Safe) list, and meets specifications for steviol glycosides set by the Joint Food and Agriculture Organization of the United Nations (FAO)/World Health Organization (WHO) Expert Committee on Food Additives (JECFA) and the European Union (EU).